Whereas cinematography refers to the straight use of the camera to create an image, many images are created through the use of other devices, or by using a camera in ways not necessarily intended by its originators. The story goes that Georges Méliès “invented” visual effects by accident. He was on the street, filming traffic as it passed when the film jammed. He continued shooting after clearing the jam. When he played back the footage, a bus had turned into a hearse, and a man into a woman, because of the elapsed time between the shots. Whether this is exactly true or not, filmmakers have been using cameras ever since to distort time and reality. While it’s a pretty predictable propaganda movie, this war of beetles against frogs and pine cones holds up today as a technical achievement of early classical silent cinema. The bad guy beetles are especially individualized and interesting, with beer steins, cars, and cannon designed for their use. And, as strange as it is to see pine cones are warriors, they make fascinating characters as well. 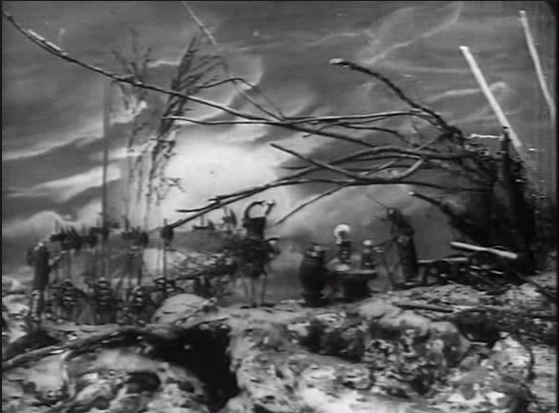 Starevich once again established his supremacy at visual effects in 1915.